Matt Otto came to PDX from Kansas City this month and I had the great pleasure of being able to do a lot of playing with him, and I helped him set up an improvisation workshop. I can honestly say that the experience had a profound impact on my musical concept. Matt's clinic was about the most profoundly interesting clinic that I have been to in years and I know that the students who were there felt the same way about it. 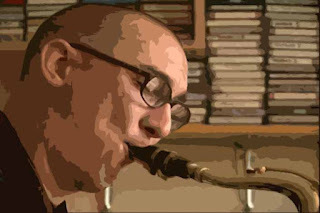 Otto's teaching concepts are influenced by his studies at several great Jazz schools. He began his studies with David Baker at Indiana, followed by studies at Berklee, The New School and Cal Arts. After being in NYC for a few years Matt started suffering from severe bouts of Carpal Tunnel Syndrome, which forced him to develop ways to practice without his instrument. He began singing with pedal drones in order to help him develop his ear. This seemingly simple exercise began to shape his entire approach to improvisation. There is quite a bit of singing in this recording of Otto's clinic and I would strongly encourage you to sing along with the exercises. If you follow along through the the entire clinic I am sure that you'll find great value in Otto's unusual approach. Matt's approach helps the improvisor to make the ear the driving force in the process of improvisation, rather than having the mind choose your notes according to theoretical rules. Maybe you could check the link as nothing seems to happen when you click on it - it just continues to 'try' to open. I speak to Matt next week, so maybe I can get it there, but I'm sure it would be great to have it online also. I loved the gig recording, excellent stuff - everyone was really happening. These are HUGE files, 90 minutes each, so they do take a long time to even load. Be patient, they do work but you might just have to let them load and come back to listen to them. I just tried the links and they took about three full minutes and I have a screaming fast fiber optic internet connection. Hi David, I heard many (some) people on the clinic asking about the drones. I notice you have the drones on the blog for people to use, but if anyone is interested you can find a soundcloud page called 'tanpura sounds' which has these on. They're very useful for practising with as each drone lasts about 30 minutes ... plenty of time to work out and sing many chord, scales, and patterns!